Inventory Full: No Means No. Except When It Doesn't. As someone once said (I think it might have been me) comments are the lifeblood of blogging. If you don't want feedback then there's not really too much point making your blog public in the first place. If you just want to keep a personal diary that no-one but you will ever see you can set your blog to be Private. Blogger and WordPress both allow that. Obviously, if you self-host you can do what you want. I'm sure it works because everything on the internet is totally private if you want it to be, right? And all the buttons you press do exactly what they say they do. "I’m afraid at the moment the work I have to do to enter a simple comment is so much that I generally don’t bother except for a few." This surprised me somewhat because I rarely have any trouble commenting on Blogger blogs. On the contrary, those are the ones where my comments tend to go through first time as soon as I hit "Publish". With WordPress blogs I have to sign into my WordPress account and then it's fine. The only blogs I really have difficulty with are ones that use Disqus and a few outliers that use unusual hosting platforms. In general, though, I don't find commenting too arduous. Of course, the one blog where I never have to jump through any hoops at all is my own. When I reply to comments Blogger knows it's my blog and gives me a free pass. So I thought I'd try commenting as someone Blogger doesn't recognize and see how that went. Oh, boy! I'm amazed I get any comments at all! I tried with Firefox, Chrome and Microsoft Edge, those being the three web browsers I have installed. Firefox was the best by a long way. 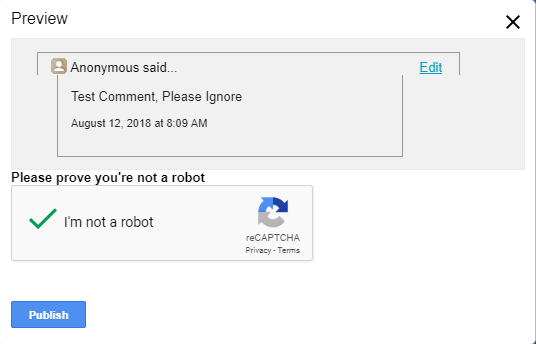 To comment anonymously all I had to do was click "I'm not a robot" once and the comment went through. Second best was Microsoft Edge. Microsoft didn't believe me when I told them I wasn't a robot. I had to select a couple of images from the notorious Captcha system to prove my humanity. I passed that test first time and through the comment went. Dead last by a country mile and then some came Chrome. Commenting via Chrome was so irritating that I would have given up long before any of the comments went through. The problem was that Chrome didn't seem to accept any of my Captcha responses. It cycled through "new image" after "new image" until eventually it ran out and failed me. Then it picked another set of images and did it again. I tried as Anonymous, using a name and a URL, and I signed into another Google account. Those are the options you get. All of them were terrible. I did eventually get a comment to post using each of them but I wouldn't expect anyone in their right mind to bother. You'd think the takeaway from this would be "Don't use Chrome", which would be ironic enough, given that Chrome is Google's browser and Google own and operate Blogger, but it's worse than that. There's a setting in Blogger that allows the blog owner to choose whether their blog uses the Captcha system or not. It's called "Show Word Verification" and you can toggle it "Yes" or "No" in Settings. Guess what mine says? It's always said that. I have never intentionally had word verification on. But it's on. I fiddled with it, switched it off and on again a few times. Nothing. I googled the issue (ho ho) and didn't find much. It doesn't seem to be a widespread issue or perhaps no-one's noticed. After all, you won't see it if you own the blog and anyone who's having issues with it is by definition going to have trouble commenting to let you know. There doesn't seem to be a whole lot I can do about it other than to apologize to anyone who's having trouble commenting here. I've done everything I can to remove all the obstacles but if the buttons don't work hitting them harder isn't going to fix it. Based on my tests I would definitely recommend not using Chrome if you're experiencing Captcha issues. I'd be interested to know who has problems and who can comment with one click, although it's all a bit academic since there doesn't seem to be much more I can do to make it easier for anyone struggling to make themeselves heard. My Blaugust advice to bloggers is go try commenting on your own blog when you're not signed in. See how easy or otherwise it is. There may be things you can do to smooth the way. Your buttons might actually work. You never know - there might be a reason you're not getting comments and it might not have anything to do with what you're posting. My workarounds to commenting on other peoples' blogs are a Wordpress account and a Google account. Usually, one or the other will work and save the account settings for the future. Disqus is a nuisance, so I rarely bother, but if really motivated to make a comment, I'll figure out a way to log in for long enough. My comment nemesis are the blogs with unusual hosting platforms or self-configured stuff that doesn't quite seem to work. I'll jump through all the hoops and key in all the required details... and then the blog swallows the comment and everything is as it was before, a calm lake of zero comment ripples. In those instances, I give right up and pretend maybe the comment went into a little bin for moderation, but I'm not likely to try again anytime soon. Ah, I meant Disqus not Askimet. I'll change that. Disqus is a total pain. I don't even bother trying to comment on blogs that use it any more. Blogger hosted sites I have no problem with, but in the past I've had problems with WordPress hosted blogs. I wonder, could you use https://www.discourse.org/ as a commenting system? Possibly, if you were self-hosting. If you use Blogger or Wordpress I think you have to use what you're given. Also, as Wilhelm says below, the more things people have to sign up for, the less likely they are to do it. I know who could start a new Blogging platform and make it work, though - Discord. I don't really mind Captcha - when it works. If I just have to click a couple of large, easy to see pictures that's acceptable. When it goes on and on and on or when the pictures are tiny and blurred it starts to become a bit too Kafkaesque for my tastes. Since I have a Google/GMail account I am usually logged into, that makes leaving a comment pretty easy for Blogger sites. Likewise, since they allow Twitter authentication, Disqus and whatever it is that Massively OP uses tend not to be an issue for me. And, of course, having a WP.com blog means no problems on blogs on that services. Even most self-hosted sites or sites on other services tend to be pretty reasonable, letting you just enter name, URL, and email address. But any site that thinks I am going to create an account for that site alone just to leave a comment is in for disappointment. If there is one thing I have too many of already it is accounts on the internet, so that is where I draw the line. And this goes double if it is just a self-hosted blog. Why would you do that? I've just stopped following sites that did that as, to my mind, it pretty much declares that you don't want interaction. It's definitely worth making both a Blogger (Google) account and a Wordpress account whichever you use, I think. I use my WP account every day just for commenting. Saves a ton of time. Commenting here is a lot less painful than it used to be (no idea what changed). Used to be I'd get all kinds of errors and have to refresh the page at every stage of commenting. Nowadays it works; it's just a bit tedious. I need to do the Captcha and all. I'm on Firefox, for the record. If Blogger was doing what it says it's doing you wouldn't have to do the Captcha. I don't think Google pay much attention to Blogger any more, sadly, so anything that breaks is likely to stay that way. I don't normally comment anonymously on Blogger blogs (except sometimes in frustration!) as I want people to know who I am and have the link to my blog too. If I do got the anonymous option I at least sign "Pasduil" at the botton. In the past I used to comment using my Wordpress identity, which used to take multiple steps. but that option doesn't seem to exist any more. So I go for Name/URL now. 1) Before I start, there is a point of lack of clarity... is it best to compose post first, or choose identity method first? 1.1) Btw comment box here is very small and does not stretch very far, making substantial comments a bit of a pain. 4) I was able to will in the Name and URL boxes, and thankfully there was at least autocomplete from last time. I don't know if this is Blogger-wide or specific to this blog. Considering how often I have to enter it, might be the latter. 5) I will now hit publish. I guess I may have to describe any additional steps in a second comment. 6) It asked me to click a box "Prove I am not a robot". I could click a button to edit my comment further before I do this, so I can continue describing in one comment so far. I clicked the box, and the comment was published! Apologies for lots of typos. This is a bit less painful than I have often experienced in the past! But still rather annoying compared to commenting on Wordpress blogs. For this second comment I however have to redo all the steps, even though I only just now commented on the selfsame blog. My annoyance starts to increase! Don't worry about keeping spammers out, worry about driving legitimate commenters away! Do not have any anti-spam hoops for people to jump through at all unless and until you are driven to it by bitter experience. Certainly on WP with the inbuilt and highly effective Akismet anti-spam filter, this has proven absolutely true. Thanks for the detailed account of your experience of the process. I have everything I can find in the options switched off for this blog. The problem seems to be that switching things off in Blogger does nothing. 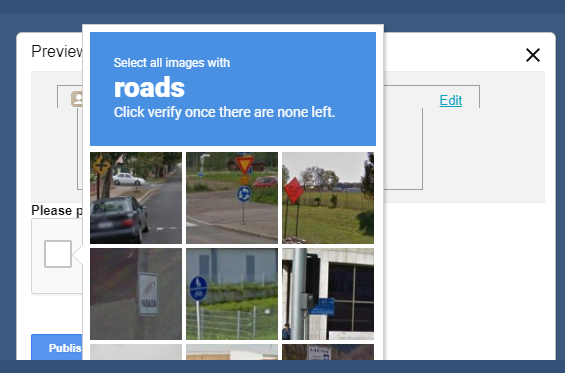 You shouldn't have to complete a Captcha or prove you're not a robot. As the screenshot in the post demonstrates, and as the title of the post emphasizes, I have said NO to Captcha. It makes no difference. Blogger doesn't do what I tell it to do! The comment box can be expanded by dragging on the botom right-hand corner, where those grey dots are. It still doesn't get very large. As far as I know that's not something I can change. I could use a "pop-up" window for comments instead of the current "embedded" option but I have read many complaints about the pop-up causing problems, for which the advice seems to be "never use the pop-up - always use embedded". I think I'll stick with the frying pan rather than jumping into the fire. Blogger already catches virtually all spam comments and throws them into a holding pen, which I never remember to check. If anyone posts genuine comments on older posts I'm afraid there's a chance they will never be seen because I have moderation set for anything over 6 weeks old because for some reason automated spam always seems to focus on older posts. I should get an email notification of those but I'm not confident it works reliably. I have Blogger set to let ALL comments on posts less than 6 weeks old go through unchecked and how many spam comments do you ever see here? Maybe two or three a year get through to appear on the blog itself, where they last about a day at most before I find and delete them. Spam is not an issue for me and has never been in seven years. I realize you've now done everything you can, and none of the hurdles were ever intentional! My comment about "Don't worry about keeping spammers out" was meant more for the wider community and esp blog newbies that I imagine might read this post! Perhaps I imagine wrongly, and in any case I didn't make that clear. I tried to comment here as Anonymous using a mobile browser (Puffin) from an iPad and it was a mess of captchas. You could not even see the text telling you what you were supposed to select, just the pictures. I wouldn't be surprised if the "I am not a robot" box doesn't work on mobile either, as I think some of them track mouse movement behavior to tell humans from bots. Even if commenting on Blogger can be relatively painless sometimes on some sites, it seems to vary so much from site to site and instance to instance, I suppose I just assume the worst. Up til now I had not considered creating an account, and I don't really want to be signed in to Google all day. But maybe I will. I might do another post on Mobile. I would strongly recommend bloggers visit their own blogs on types of devices they don't normally use themesleves. My blog is absolutely optimized to be s een and read on a desktop PC. It looks fine on a Windows laptop as well and on a Windows Tablet. Basically, if you read my blog under a Windows OS it probably looks fine. On Android the text of the posts is ok but almost all the rest of the blog is missing. The layout, on which I spend half my time, is completely borked. The blog roll is just plain missing. I have never been able to find it at all on an Android device. If anyone can see it on Android, please tell me where to look! Almost anything in the sidebar isn't there. I have an ancient iPod Touch and I can read the body of the posts on that. I've never tried to do any more. I don't have access to any other Apple devices to check how it looks. As for what it might look like on n on-standard browsers on Mobile (Puffin? What's that?!) I would bet that Google has never made any attempt whatsoever to optimize for them so it's amazing if they work at all. I think most of this is far beyond the capabilities and interests of most MMO bloggers to address. If the platforms don't handle it and you aren't a strong HTML coder yourself you pretty much have to make the best of what you're given. I agree that there is only a limited amount that bloggers can do about the shortcomings of their platform, whether it's in barriers to comments, handling mobile devices or whatever. Those that lack the tech skills or the time and inclination to tinker can do almost nothing. The main upshot of what's come to light in this post (from both our various experiments, but mainly yours) is that it reinforces my belief that new bloggers should go for Wordpress. On WP.com, the themes are nowadays all mobile-friendly and adapt well to all shapes and sizes of device. I am glad however that *you* are on Blogger as you have the most incredible blogroll which makes an excellent MMO blog reader in itself! It has also been useful to discover that commenting as Anonymous makes things a bit smoother, and maybe I will switch to that as my new normal. EDIT: Uh oh, this time it's asking me to do an captcha. Same Win PC & browser I used before without having to do one! Btw Puffin is a browser I use on iPad for things that don't work well in Safari! If sites don't work in Puffin there is really little hope of using them on my iPad at all! It's strength (which can sometimes be a weakness to) is that the site is read from Puffin's servers, compressed, and sent to the mobile device. That means the site normally treats the request as coming from a bona fide computer, which bypasses any shortcomings (often deliberate!) in what it serves to mobile devices. I've been having issues the last few days with the captcha image not loading on mobile(chrome) for one platform or another. It's actually prevented me from commenting several times. Not sure which platform it is that's giving me issues yet though. The more I see and hear about this, the more obvious it is that something is totally screwed in Blogger. I'm not going to up and move to Wordpress until and unless Google actually shuts Blogger down but I think if I was starting now I'd be inclined to go to WP. I have had instances of blogspot flat-out eating my comments on other people's sites, though; not much to do about that.